The story below makes it clear how much my father appreciated the people in Quorn when they were stationed there before D-Day. I’ve submitted the story to the BBC archives they were collecting a few years ago and the online Quorn Museum has picked this story and The Apple Tree to include with their artifacts (#487). 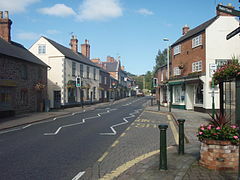 We visited Quorn in 2003 with both my sons and it was the most memorable part of our trip because of the friendly people. 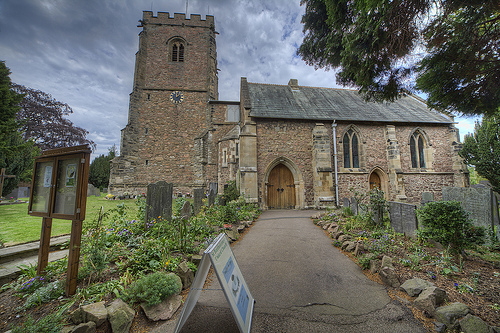 Quorn is a small English village inland from the sea a good 40 or 50 miles. Not known particularly for any one industrial achievement, or in fact, not even known to exist by the world in general, and England in particular. Situated 9 miles from Leicester and 2-1/2 miles from Loughborough, it has no important strategic value, and there’s no reason why anyone should want to go there intentionally. Should any wayward travelerstumble upon it, they might shrug their shoulders and forget it almost instantly—but for its exceptional friendliness for strangers. Such strangers were the troopers of the veteran 505th Parachute Infantry when they boosted the population of Quorn by some 2,000 odd. By invading the town’s limits in the wee dark hours of a cold March morning, their presence gave rumor mongers all the combustible material necessary to precipitate another side war between the colonies and England. Much smaller in area and lesser in population than most of the neighboring townships, they more than made up for it with kindness and human understanding. Any tired or hungry soldier (English or American) would not have to look further than the first pub they entered. The people of Quorn had the unusual knack of getting along with any type of soldier, be he the friendly type or the other extreme. The natives of Quorn never failed (or hardly ever) to welcome their new-found friends into their homes. First off, they’d introduce the stranger to the little woman. “Ma, this here bloke is Joe Brown, from Pennsylvania!” he says. The wife would accept the introduction nonchalantly as though Pennsylvania was somewhere near London. Their comrade in arms’ affection greatly rejuvenated the well-worn, but not battle weary paratroopers, troopers whose actions had played a great part in two invasions and were yet to be instrumental in four other major campaigns. The lift in morale the regiment experienced in Quorn was so terrific, that when General Eisenhower stated to the assembled division that he wouldn’t think of attempting the invasion of Normandy without us, he was saluted by steel helmets slamming into the concrete runways. I don’t believe there’s any other officer who can claim this distinction. However, Ike was equal to the occasion. He smiled. Whether he approved or not we never learned. However, I believe this demonstration convinced him of the division’s tremendous spirit – greatly revived by the people of Quorn.